Cocktails are apparently on the up in the UK. This is a trend that I, for one, am happy to see. Ever since I had my first glass of Pimms as a teenager, I perk up when I hear the word cocktail. Mojitos are a rather more recent discovery for me, but now I’ve had the odd, ahem, one or two, I’m finding it hard to make a choice. Would you plump for a Pimms or make friends with a Mojito? According to Thebar.com, we Brits are a divided nation when it comes to cocktails, as you can see from the infographic below. Northerners go for a classic gin & tonic whilst Southerners prefer a Pimms no. 1 with lemonade. It’s mojitos all the way for the Welsh and the Scots are rather fond of them too; incredibly they come in slightly above a whisky and ginger. As for the Midlanders, they are somewhere in between, with divided loyalties: some opt for a glass of G&T and others go for Pimms. To be honest now summer has arrived, give me a comfy seat in a pretty garden with a few good friends and I’m happy with pretty much any cocktail you care to hand me – just let it be cool with plenty of ice. However, it’s no use waiting for a cocktail to magically appear at my side, time to shake up one or two of my own. I’d just been sent the means to do so after all. A rather heavy wooden box, nailed down for extra security had found its way to my door, courtesy of Thebar.com. Their Shake It Up page gives you pretty much all the information you need to create your own summer cocktails, whether they are to enliven a BBQ, a picnic, a party or any other kind of gathering. #LetsCocktail. Pimms was the cocktail of choice at The Royal Show up at Stoneleigh when I used to work there, which is perhaps why my memories of the annual show are rather pleasant, if a little hazy. Anyway, that was the one I decided to make first. Lots of strawberries, cucumber, mint and ice are the secret to a good Pimms, although The Pimm Daddy recipe provided included slices of orange too. Checking the freezer, I realised we had no ice and even worse, no ice-tray – agghh. I hotfooted it off to see if I could find an ice-cube tray and buy some local strawberries and lemonade whilst I was at it – living in town can be very handy sometimes. Never having added oranges to Pimms, I didn’t see why I should start now, so those were not included. But that’s the beauty of cocktails, they’re infinitely adaptable. Having thoroughly enjoyed our Pimms one rather hot afternoon, I decided there was nothing better. But a couple of days later, I mashed up a Mojito. Knowing very little about this cocktail – I know, where have I been hiding? – I still couldn’t quite follow the recipe and reduced the sugar by half. Oh my days, how good it was. Now I have a new dilemma, Pimms or Mojito? Never mind, next up are the G&Ts! 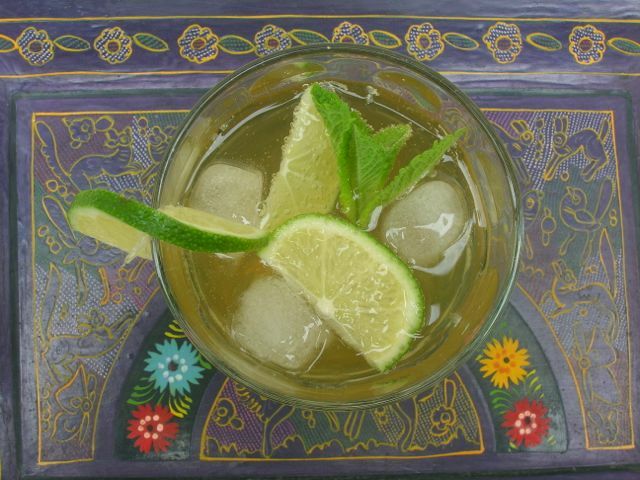 How to prepare a glass of classic British pimms and mash up a Cuban mojito. Add the strawberries, cucumber and one sprig of mint. Pour in the Pimms, then top up with lemonade. Stir well and garnish with remaining sprig of mint. Place the rum, lime slices, mint leaves and sugar into a lidded glass jar and shake it well until the sugar has dissolved and some of the lime juice has been released. Pour into a glass, add some ice cubes, then fill with soda water. Give a good stir and top with the mint sprig. The quantities can be upscaled according to the number required and served from a jug. Pimms - 0.7 units of alcohol per serve. Mojito - 1.9 units of alcohol per serve. Where would a good summer BBQ be without a glass of Pimms or some other tasty cocktail? So with that in mind I’m sending this of to Janie at The Hedge Combers to accompany all those Tea Time Treats. Karen over at Lavender and Lovage will surely take a glass. Thanks to Thebar.com for the ingredients to make these cocktails. I was not required to give a positive review and as always, all opinions are my own. What a fascinating map, and two of my favourite cocktails. I think you’ve inspired me to mix up some of these this evening – thanks for sharing!! Thanks Kate, they are both so good. the question is, which one will you go for? 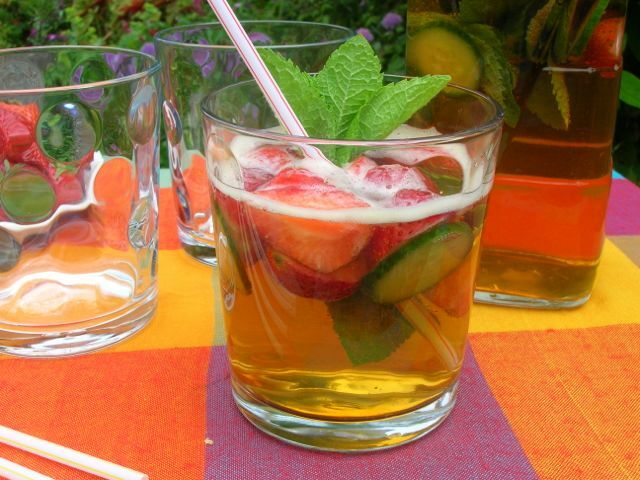 Lovely, I only discovered Pimms last year when we moved to Brighton and love it, especially on hot, summer evenings… But never knew how to make it, thanks for sharing the recipe! I have also bottle of Captain Morgan Original Spiced Gold rum so I may be trying this mojito recipe, never made it from scratch, used to use lime & mint syrups. Pimms is a hard one to beat I reckon. I’ve never known anyone turn down a glass. I love both – I do find the mojitos served in bars rather sweet, so I guess the solution is to make my own! I agree Fiona, I don’t like my drinks too sweet, so halving the sugar worked well for me. What a great drink for summer! My taste in cocktails tends towards the Scottish! That’s unexpected. I like a Pimms, but generally I prefer it made with ginger ale. Whisky and ginger for you then Alicia? I do very much like your suggestion of Pimms with ginger and will now have to try it. Haha, really Felicity? It’s not Pimms for me unless it has cucumber in. I think they might count as cocktails Kristina – not that I’m an expert. I absolutely love Mojitos, in fact I just shared my Mojito Mocktail recipe over on my blog if you want to have a read here! I also love Pimms too, such refreshing drinks for Summer evenings! Ah good to hear someone coming down on the side of Mojitos Laura. That’s so funny….. a North-South cocktail divide! Frankly, I am happy with any and all of them….. One after another if necessary. Although given a choice (and despite being a southerner) my favourite will remain a Mojito! I was lucky enough to drink them freshly made in the Haciendas of the Cuban mountains many years ago and they have remained top of my list ever since! Ah Kate, if you are going to have a Mojito, it sounds as if you were in the best place to have one. Would love to go to Cuba. Pimms is starting to be outvoted now. I love cool cocktails – they are so refreshing! I do love cocktails, I really need to make them more often! I rarely think to make they either Kavey; this was just the push I needed. Now you have me crave pimms! I love the map! I’m in the midlands and do love a G&T so I guess I am part of that statistic. I also love a mojito but then I also love pimms… hmmmm 🙂 not sure what that says about me! Teeheee..
Mr CC and I occasionally go out for cocktails and thoroughly enjoy it! He likes a classic Sidecar, whereas I can be swayed by anything with rum! As CC, so you come down on the side of mojito. No idea what a Sidecar is, but I’m just going off to find out. Not keen on Pimms, but could sink oen (or more) Mojito’s quite happily 🙂 Thanks for sharing with Tea Time Treats Choccy, they’re the perfect BBQ tipple!